How do you make the flagship executive saloon in your range even better? You improve the engine while keeping the interior and exterior appointments and decor the same (if not better). 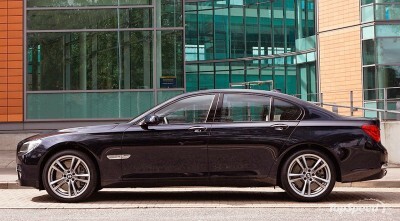 This is exactly what has been done with the new BMW 740d soon to reach Australia. From the outside, the BMW 740d looks like others in the seven-series line, which means it simply oozes class and sophistication. The BMW 740d has been designed to look like a superior drive from the classic kidney grille and twin headlights at the front to the tastefully discreet chrome-trimmed twin exhausts at the rear. And if you have selected the BMW 740d M Sport variant as opposed to the standard BMW 740d, then you will also be able to make out the discreet –but telling – M badge on the rear. On the inside, the BMW 740d is spacious and comfortable, and the interior is tastefully trimmed in Dakota leather with high-gloss wood trim. And the sunroof also comes as standard. The beating heart of the BMW 740d is a six-cylinder in-line Twin Turbo diesel unit that has been designed to maximise efficiency and maintain a high standard of performance. The Twin Turbo system incorporates variable turbine geometry for optimum performance. When it comes to the hard numbers for the BMW 740d’s engine, the maximum power output is 225 kW, which is reached at 4400 rpm, while the torque curve peaks at a massive 600 Nm when the needle hovers over the 1500 mark. This is a diesel engine at its best. All this power and torque is yours to command via the six-speed automatic/Steptronic transmission. The handling in the BMW 740d is nothing short of superb, as you would expect from anything in the 7-series range. The Dynamic Stability Control (DSC) suite and the variable damper control in the chassis combine to make the ride inside the BMW 740d supremely comfortable and responsive as well as maximising the safety and grip. Specifically, the DSC suite comprises ABS brakes with EBD, Brake Assist and Cornering Brake Control, plus the Automatic Stability Control and Engine Drag Torque Control. The servotronic power steering is responsive and accurate, as is the cruise control with brake function – just take hold of the leather-trimmed multifunction steering wheel and see for yourself. Inside the BMW 740d – well! Lumbar support for both driver and front passenger. Follow-me-home Xenon headlights with high-beam assist. Auto-dimming exterior mirrors (which, technically are exterior features but are best appreciated from the inside). Quad-zone climate control so everyone can travel in cool comfort. Footwell lights and interior ambient lighting. A high quality sound system with a CD/ratio player plus an auxiliary input jack. Anti-trap electric windows with a handy comfort closing function. And that’s just some of the features available. However, it remains to be seen what will be provided inside Australian versions of the BMW 740d, but if UK models are anything to go by, we can look forward to seeing a 10″ colour display screen, Bluetooth connectivity, and a multimedia navigation system. You don’t get to drive a BMW 740d without learning a few things about responsibility, so naturally the BMW 740d comes with a high level of safety features. The list starts with a full complement of front and side airbags, the Advanced Head Protection System front and rear, anti-whiplash head restraints in the front and pretensioned load-limited seat belts in the front. A word needs to be said about the impact-absorbing crumple zones (deformation zones) in the front and rear bumpers. After impacts of 4 km/hr or less, these zones will cleverly regenerate to their original shape, so you won’t be left with an unsightly dent after accidentally nudging into a letter box – or being nudged by someone else. For any more information on the BMW 740d, or for that matter any other new car, contact one of our friendly consultants on 1300 303 181. If you’d like some fleet discount pricing (yes even for private buyers! ), we can submit vehicle quote requests out to our national network of BMW dealers and come back with pricing within 24 hours. Private Fleet – car buying made easy!